Lower the seat height on the Yamaha MT09 using this rear suspension lowering kit. By installing this kit the rear suspension is lowered and the seat height reduced by 25mm (1 inch) for year models 2014-2016. For later MT09 models 2017-2018 we offer a 20mm (0.8"inch) lowering kit. Do NOTE that the 25mm lowering kit for earlier year models 2014-2016 will NOT fit later models from year 2017 onward!. When installing this kit the front forks are also lowered by adjustment of the front fork legs upwards in the triple clamps. This lowering kit is an excellent aftermarket accessory for your the MT09 which enables shorter riders to reach the ground with both feet. If you find your Yamaha MT09 to high and struggle in traffic lights and every time you come to a stop because of the high seat height of your MT-09 this kit will resolve your problem. When this kit is installed the front forks are also lowered by adjusting the fork legs upwards in the triple clamps. 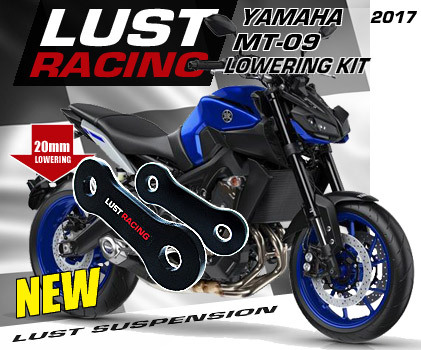 Seat height and ride height lowering kit for Yamaha MT09 by Lust Racing. The kit includes new steel suspension links that replace the stock suspension links on your Yamaha MT09. New, young and short riders find that the lowered bike is easier to handle. Lowering the bike spurs confidence and reduces riding errors as a result. By fitting a lowering kit for your Yamaha MT09 you no longer need to tip-toe in traffic lights.